Andy Roddick's final handshake of his professional tennis career. Andy Roddick announced that the 2012 US Open would be his last tournament. At first I was shocked, appalled even; how could he do that to tennis? To me? To the world? We all knew it was going to happen eventually. It was, in my opinion, just too soon. Roddick resumed his fourth round match, after a lengthy rain delay, against Argentine Juan Martin Del Potro. The two came back to finish a first set tiebreaker, which Roddick was leading with the first point. Andy Roddick took the lead quickly in the tiebreaker and closed out the first set. I thought for sure Roddick would continue his run at the Open with the coming sets. Clearly the “tennis retirement gods” had other plans. Del Potro found his range and reminded himself that he was the #8 player in the world. He came back storming in the second and third set. In the fourth set, I don’t know if was me or just everybody else, but it felt like I knew he was going to finish in this set. The end was near. I thought for sure Andy Roddick was goign to find that extra bit of energy deep down and pull out the fourth set. I was hoping the crowd would somehow carry him into finding winners. Unfortunately, neither worked. Del Potro got the break early in the fourth and rode the coattails from there. Roddick served down 3-5 and found a way to hold; at that very moment, the entire crowd knew, this would be the last time the world would see Andy Roddick shake hands with an opponent at an ATP tournament. And then it happened, like 825 times before, the match ended. Andy Roddick walked clamly to the net to shake hands with his opponent to say “good match.” This time, though, it was the last. Juan Martin Del Potro sent Andy Roddick into retirement. No hard feelings though, it is tennis and there has to be a winner and an equal loser. I wasn’t ready for Andy Roddick to finish today, I wanted one more match, one more ace, and perhaps one more broken Babolat Pure Drive. Instead he took the microphone and said, “For the first time in my career, I’m not sure what to say.” Then he added, “It’s been a long road, a lot of ups and a lot of downs.” “I haven’t made it easy for you at times.” Pointing to the crowd. Then he grabbed his tennis bag, waved goodbye, and walked off the court. It was emotional, though it was sweet. 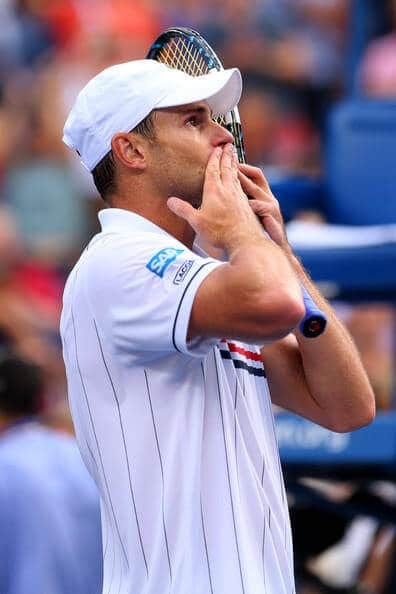 Andy Roddick had towel fuzz all over his chin and tears in his eyes. 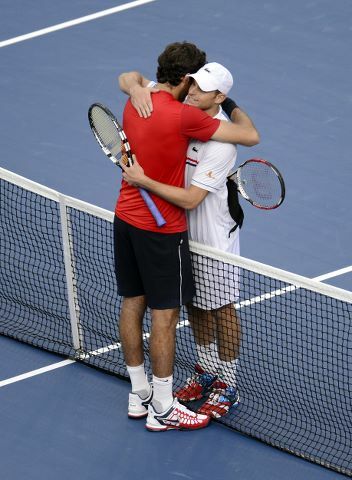 It was a refreshing moment, like the weight of the world had been lifted from the Roddick shoulders. He was happy it seemed. Andy Roddick had an amazing career, though he underachieved in the majors, he accomplished so much. Looking back at the last few years of Andy Roddick’s illustrious career, I’m somewhat relieved that he’s retiring. To be honest, it was starting to get a bit emotionally draining rooting for him every time he played, only for him to make some bonehead mistakes and lose an easy match. Nevertheless, I was always an Andy Roddick fan. I probably always will be too. 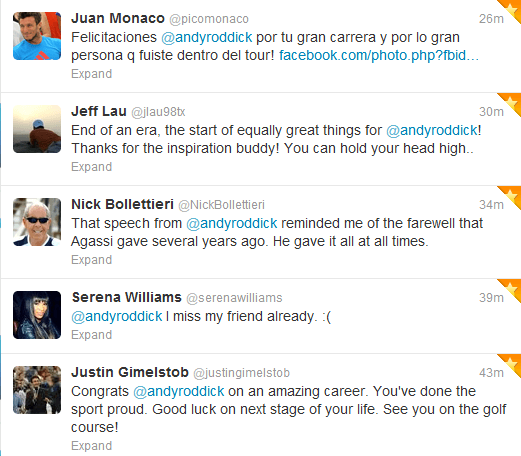 Andy Roddick will always be a champion, active or not; he will remain as essential name in tennis. I’m sure that we will be seeing more of Andy next year roaming around…perhaps a future Davis Cup Captain? So here’s to you Andy Roddick, happy retirement!